Tom O’Sullivan has a recording that could ruin a corrupt judge’s reputation and his chance to be appointed to a Senate seat. Pastor Eric Snow, the leader of a megachurch, also has his eyes set on the appointment; but how much of what he has come to believe is he willing to turn his back on? Examiner reporter, Garry Strider, threatens to uncover both candidates secrets—but the investigation may just cost him his life. The Ambition is Lee Strobel’s first venture into the world of fiction—a big step from his nonfiction “Case” series that has earned him the title of New York Times Bestselling Author. This venture was an excellent choice. Lee grabbed me with the first pages and drove me through the rest without wanting to stop. With great pacing, the book builds up on the suspense which made me want to keep reading. 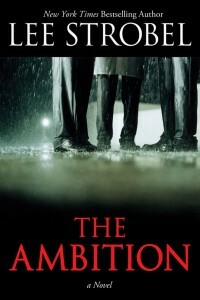 The Ambition is not like many suspense novels where the author starts with suspense, then dulls it down for the next 75 pages or so and then spikes up the suspense again and repeats the process. Lee makes sure that he makes his reader’s mouths hanging wide open and dying to see how things turn out. Lee’s characters are fleshed out and are not difficult to connect with. I am sure that anyone who has or will read this book in the future will agree with me that the most interesting character in this tale of suspense and politics is Pastor Eric Snow. Be sure to follow this character closely as you read, as he is a wonderfully crafted, complex character. As with many novels, The Ambition is not without some faults. The characters were hard to follow in the beginning of the novel, but Lee puts things in order for us within the first 75 pages. A few times, the actions of the characters are not as well explained as I would have liked, but it leaved me to think about what brought them to what they did. Neither of these things made the novel any less enjoyable. The novel does end off quite suddenly, but still satisfies. Maybe this could be a hint at a sequel? I have received a review copy of this book for an honest review from the publisher. All thoughts and opinions are mine. Previous Have You Read The Hunger Games?